On Saturday April 2, 2011, the museum will offer an exclusive opportunity to view the wonderful art collection at the Union League Club of Chicago. The Union League has the largest club art collection in the country, if not the world. It currently consists of nearly 800 works of art including paintings, sculpture, works of art on paper, photographs, and some decorative arts. The focus of the collection is American with a particular emphasis on artists connected to Chicago. 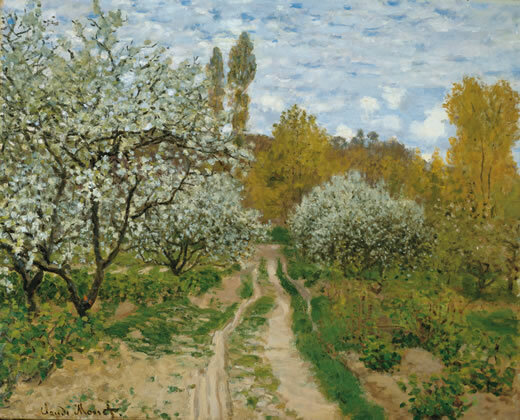 In spite of that focus however, the signature painting is Pommiers en fleur, an 1872 work by Claude Monet, pictured above. The collection represents more than 120 years of collecting, reflecting the changing tastes and trends of a segment of Chicagoans, artists and patrons. The collection, often referred to as “Chicago’s hidden collection” continues to grow. John J. Glessner was a member of the Union League Club from 1887 (the year he moved to Prairie Avenue) until his death in 1936. Not surprisingly, numerous residents of Prairie Avenue were members, and three served as president: Elbridge Keith (1900 S. Prairie Avenue), George Bissell (2003 S. Prairie Avenue), and John Hamline (1621 S. Prairie Avenue). A fine portrait of Elbridge Keith, painted by Ralph Elmer Clarkson, is part of the club collection, although not currently on display. 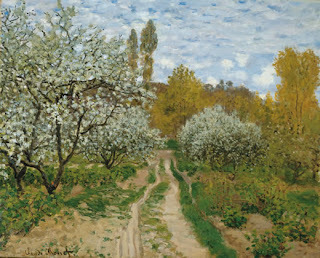 At least one Prairie Avenue resident, Frederic Clay Bartlett, created a work now in the collection (Martigues, France). The April 2 tour will be led by Joan Wagner, author of A History of the Art Collection of the Union League Club of Chicago. Following the tour, participants will lunch in the Heritage Room (where Bartlett’s painting is on display). Group size is strictly limited. For further information on the tour or to make a reservation, please call 312-326-1480. For further information on the art collection, visit the Club website at http://bit.ly/eTL8M7.